He contrasts this with the West where only the big players like Apple and Google can step up to the plate. Everyone else is forced to use the embarrassingly obsolete hardware we are all familiar with. But [Bunnie] wants to get his foot in the door. “Can we find a way to still get ahead, yet still play nice?” he asks. Part of his solution is reverse engineering so that hardware can simply be used – something the EFF has helped legally ensure under fair use. The other half is to make it Open Source. His philosophy is rooted in making a stand on things that matter. It is far from a solid legal foundation, but [Bunnie] and his lawyers are gambling that if it heads to a court, the courts will favor his side. The particular board targeted is the one described above – the MT6260. Even spurred by the shreds of documentation he could gather, his company is a 2-man team and cannot hope to reverse engineer the whole board. Their goal is to approach the low-hanging fruit so that after a year, the MT6260 at least enters the conversation with ATMega. Give up trying to use it as a phone; just try to use like the Spark Core for now. He is already much of the way there. After telling you what is on board and why we would all want to use it, [Bunnie] shows how far he has gone to reverse engineering and describes his plans for the rest. From establishing an electronic “beachhead” base of operations to further probe the device, to X-rays, photos, diagrams and the beginnings of an OS. If this type of thing interests you at all, the meticulous approach and easy-reading of this tech teardown will surely impress and inspire you. Every step of progress requires a new hack, a new solution, a new ingenious way to pry information out. We’ve featured some awe-inspiring reverse engineering attempts in the past, but this is something that is still new and relevant. Rather than only exploit his discoveries for himself, [Bunnie] has documented and published everything he has learned. Everyone wins. Thanks [David] for the tip. Arduinos are fun to tinker with, but there's one problem. Once you've built something cool, you pretty much have to tear it down to use your board for another project. Sure, you can always buy multiple Arduino boards or proto shields, but what if you want to turn your creation into something a bit more permanent and a lot more compact? 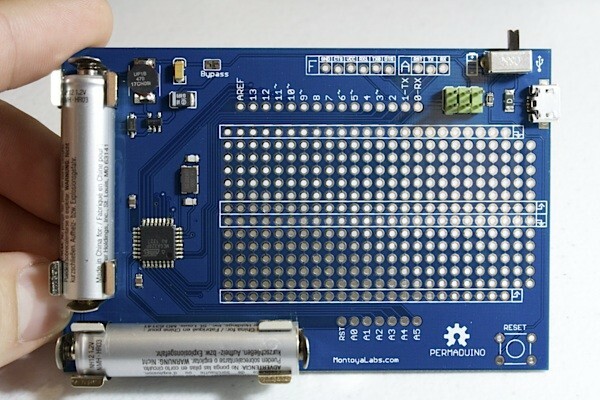 Say hello to Permaduino, a small battery-powered Arduino prototype board that just launched on Indiegogo. It features an Atmega328P (natch), two AAA battery holders with a 3 to 5V DC-DC converter (up to 180mA), a 25-column breadboard with VCC and ground, plus FTDI, AVR-ISP and USB interfaces. Best of all, Permanuino conveniently fits inside a standard 8mm videotape case (as long as you don't mount large components on that breadboard). Interested? Hit the break for the Indigogo link and campaign video.